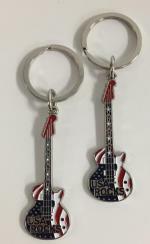 Patriotic Guitar with "USA ROCKS" is available in a RED/WHITE/BLUE design. These measure 2 1/2" and are attached to a 1 1/4" flat split ring. Packaging is 12/Card.